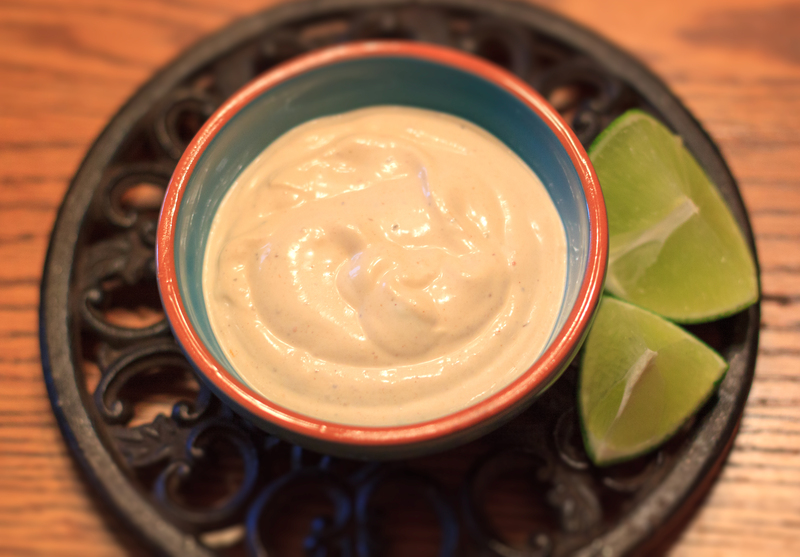 My version of a classic Mexican cream sauce, kicked up with zippy chipotle adobo and fresh-squeezed lime juice. This condiment is a must on authentic Baja fish tacos. You can also serve it with huevos rancheros or as a dipping sauce for a variety of other needs. Double the recipe if you need more. Will keep for at least a week in your fridge. Enjoy! Place the ingredients in a medium-sized mixing bowl. Whisk vigorously for two minutes. If the sauce is too thick, thin it with a couple of tablespoons of buttermilk. Either serve in a dish or place in a plastic squeeze bottle. Refrigerate for two hours before serving. 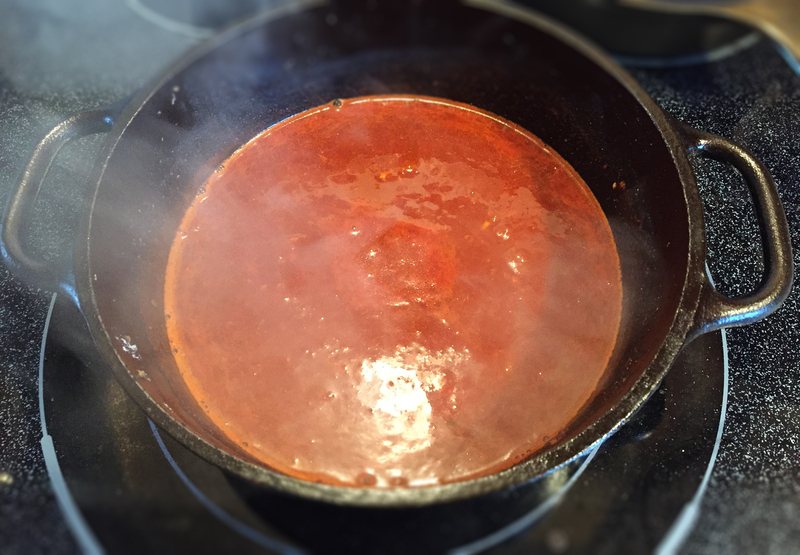 This is my version of a classic, authentic New Mexican red sauce, which is properly served over made-from-scratch enchiladas, huevos rancheros or basted over braised chicken and beef. You can also prepare this recipe using green New Mexican chile powder. The reason why I like preparing this sauce using ground chile pepper vs. whole chile is that you eliminate the time spent straining the blender puree from the tough, and sometimes bitter pods. You’ll also get a more consistent, velvety-smooth sauce. Salt to taste, about 1/4 to 1/2 tsp. Using a heavy saucepan (preferably cast-iron) over medium heat, bring the olive oil up to temperature until shimmering. Add the garlic and onion and sauté for five minutes until tender, stirring constantly. Be careful so it doesn’t scorch. Next, add the flour and continue stirring to form a roux. Add the bacon fat or chorizo if desired. When the roux turns a medium brown color (about fifteen minutes) add the chile powder and the rest of the ingredients. Bring up to a boil and then reduce heat and simmer for about a half hour until the liquid has reduced by half. Whisk to break up the lumps. Stir often. Don’t thicken it too much — the consistency should be similar to melted ice cream. It will continue to reduce when used in recipes that require baking. Makes a little over one cup. Buy the best Hatch chile powder you can find. It must be pure and not cut with other ingredients. Control the heat of the sauce using crushed chiltepin or cayenne pepper. Always opt for a milder chile powder — you can always kick up the heat later, but you can never take it back. The Lodge 2-quart cast-iron serving pot (shown below) is ideal for this recipe. It assures even heating without the risk of scorching the roux. Note: Culinary Compost never endorses products for profit, and has received no monetary compensation for the content of this post. This is a tried-and-true recipe that never fails to please. The secret is the second-run through the egg wash. It allows the breading to set up better. The result is a fantastically light, crunchy coating enhanced by the addition of corn starch which helps keep it from getting too dense, while locking in the juices. You can use a digital meat probe to test for doneness. The chicken should be golden-brown and read 165° F in the thickest part. If you trim the pieces as indicated, you will not have any issues. You’ll also get great results using wings — keep in mind they cook faster, so watch them carefully. A note on the wing sauce — this is a favorite of mine from Buffalo, New York; the undisputed wing capitol of the United States. It is, however, by no means “suicidal.” It has plenty of heat and a lot of tang; the balance being just right for my taste. Try it. I think you’ll agree. Using a large cutting board, lay out the chicken breasts and cover with a double-folded piece of plastic wrap. Pound flat with a meat mallet. This ensures even cooking with no underdone spots in the middle. Cut the chicken into 1″ strips against the grain to ensure they are tender. Then trim the strips so they are about 3 to 4″ in length. Prepare the egg wash mixture by whisking the eggs in a wide, shallow bowl. Add the buttermilk and lemon juice. Whisk again. Add the chicken pieces. Coat well and set aside for at least 20 minutes. Prepare the flour dredge ingredients in a separate bowl and mix well. Prepare the breading mixture in another bowl. Preheat 1.5 quarts of peanut oil in a heavy cast-iron 4-quart chicken fryer until the temperature reaches 375° F.
Using a tongs, remove the chicken pieces from the egg wash and dredge in the flour mixture until evenly coated. Shake off the excess flour and set them aside on another plate while you work. Then quickly dip the tenders back in the egg wash and roll in the breading. Working in batches of 3 or 4 tenders, carefully dip them into the hot peanut oil. A Chinese spider-strainer works great for this. Cook for no more than two minutes per batch, turning once at one minute until golden-brown. Remove and set aside on paper towel. Place the tenders in a large mixing bowl and add the wing sauce to taste. Carefully toss until evenly coated. Serve with the Buffalo Bleu Cheese Dressing and celery planks. Garnish with the green scallion, sprinkled over the top. Each breast will yield about eight tenders. A variation of two classic, time-tested Italian recipes — the chicken should be seared on the grill over real wood charcoal — anything else is setting yourself up for an inferior presentation. Six hours before serving time, pound the chicken breasts flat on both sides using a meat mallet – this will ensure even cooking on the grill. Season each side of the breast lightly with Kosher salt. Mince five garlic cloves and whisk with 1/4 cup XV olive oil, 1/2 cup fresh-squeezed lemon juice, the Balsamic vinegar, minced fresh oregano, basil and crushed black pepper. Chill until an hour before you are ready to grill – rotate the chicken occasionally in the marinade. Prepare a heavy stock pot with enough water to boil the pasta. Heat on medium-high with a dash of salt. Prepare an outdoor charcoal grill with enough wood charcoal for a medium-hot fire. When white-hot, level the coals and place the chicken breasts directly on the center of the grill grate. Char and turn after four minutes. Turn again and check for doneness when the juices run clear. The breast should be firm with an internal temperature of 165° F. Remove from heat and let rest in a heavy covered dish. While the breasts are grilling, heat a heavy, cast-iron pot over medium-low heat. Add the olive oil and minced garlic. Saute for four minutes, stirring constantly, taking care not to scorch the garlic. Add the butter. Stir until melted. Increase heat slightly and slowly add the cream, grated Parmesan and white pepper. Bring to a simmer, then reduce heat and stir constantly until thickened, about six to ten minutes. Shut off the heat and cover. While the breasts are grilling, bring the pasta water to a rolling boil. Add the pasta, calculating the finished serving time, and cook according to box directions, stirring occasionally – about six to nine minutes, until al dente. Drain and keep covered. When the alfredo sauce is done, add to the drained pasta. Mix lightly. Slice the chicken breasts and serve on top of the pasta/sauce. Serve with a garden spinach salad and Italian bread. 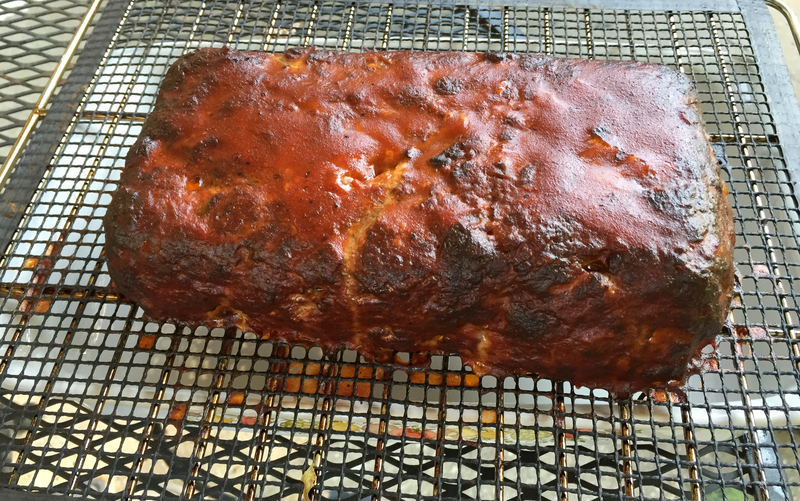 The meatloaf was smoked on a silicone smoker mat purchased from QVC. It has really come in handy for a variety of recipes including fish and pork chops. This is a recipe from smoked foodie author Jeff Phillips. Jeff really knows his way around BBQ – I followed the recipe exactly and it was an instant success. I’ve included links for his book, as well as his rub and sauce recipes. Take two slices of loaf bread or the top and bottom half of a bun and tear it into small pieces. With the bread in a small bowl, pour ½ cup of buttermilk over the bread. The bread will soak up the buttermilk and this will be part of what makes the meatloaf so moist. Once the milk is soaked in, crack a couple of large eggs onto the bread mixture. Stir gently to combine. Dice bell peppers, onion and celery so that you end up with about ½ cup of each. If you have extra, place them in a zip top bag and place them in the freezer for later. Put 2 TBS of olive oil into a skillet over medium heat. Once the pan is hot enough, pour in the onions, peppers and celery and stir to mix with the oil. Let them cook for about 10 minutes or until the vegetables start to get slightly soft. Once the veggies are finished cooking, remove them from the pan and into a plate or bowl to cool. Add ½ cup of Jeff’s barbecue sauce and 3 TBS of Jeff’s rub to the sautéed vegetables. Stir to combine. Place the 1 pound of ground chuck and 1 pound of ground sausage into a large mixing bowl. Add the bread, buttermilk and egg mixture to the top of the meat. Add the vegetable, sauce and rub mixture to the top of the meat as well. Add 1 teaspoon of salt to the top of the mixture and gently combine the ingredients together. Do not overmix. Do just enough to combine and stop. Overworking the meatloaf mixture will make it tough. Pour or scoop the mixture onto a cookie sheet, food grade butcher paper, etc. and form into a loaf with your hands. You can also place the mixture into a loaf pan to form it and then dump it out onto the pan, rack or tray that you will use to cook it. You will notice that this mixture may be a little wetter than what you are used to using but that’s ok. It will form and hold together just fine. I recommend about 2 inches thick in the shape of a rectangle but you can get creative with this if you like. If using a Bradley rack, I recommend placing a piece of wax paper under the meat so it will be easier to remove once done. Set up your smoker for cooking at about 225-240°F using indirect heat with hickory smoke or whatever smoking wood you have available. If your smoker has a water pan, I recommend that you use it. Once your smoker is maintaining the proper temperature, the cooking can commence. Place the meatloaf in the smoker. Let the loaf cook for 3-4 hours or until it reaches about 155°F. At about 155°F, brush the top and sides of the meatloaf with plenty of Jeff’s barbecue sauce. Give it about 25-30 minutes to caramelize then remove from the smoker. Finish temperature for meatloaf is actually 160°F but knowing that it will continue to cook and rise in temperature even after being removed from the smoker, it is ok to remove it a few degrees early. Once the meat is brought into the house, tent some foil over the top and let it rest for 15-20 minutes before slicing and serving. This resting period gives the juices in the meat time to redistribute throughout the meat. 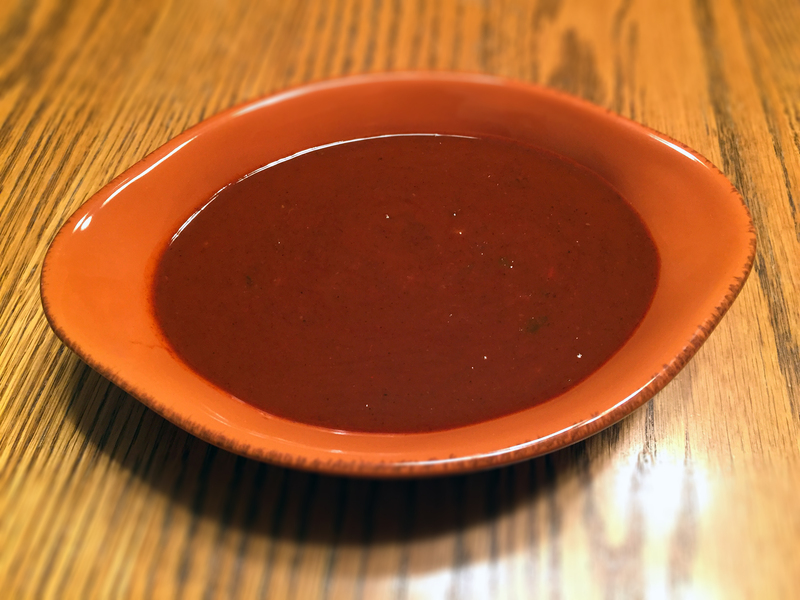 Here is my version of a tangy-zippy BBQ sauce based on recipes from North and South Carolina. It is amazing on BBQ pulled pork — a great alternative to a heavier BBQ sauce that lets the flavor of the smoked meat come through. Combine the ingredients in a non-reactive sauce pan and bring to a rolling boil. Simmer for three minutes, stirring constantly. Remove from the heat and when cool, store in your fridge for at least three hours, allowing the flavors to set. Drizzle over pulled pork sandwiches. Makes one cup. Will last for months in your fridge when sealed. This recipe can also be modified by adding red/orange bell pepper and red onion. Any way you serve it, rest assured, the presentation is stunning. This recipe is a home-run for busy families. I created it after examining and testing three different versions. Marinated chicken with a combination of Greek spices is skewered, then seared over hot coals and served in a warm Pita bread shell with an amazing Greek Tzatziki sauce. Minimal prep time meets maximum taste — Opa! 1 handful fresh oregano, stemmed and fine chopped – about 4 tbs. 1 small sprig fresh oregano, stemmed and fine chopped – about 1 tbs. Prepare the chicken marinade ingredients and whisk thoroughly in a bowl. Cut the chicken in 1/2″ slices and place in the marinade. Mix to coat and let stand covered in your fridge for at least 3 hours. Rotate once per hour. Prepare the Tzatziki sauce and mix well. Cover and chill for at least 2 hours so it has time to set up. 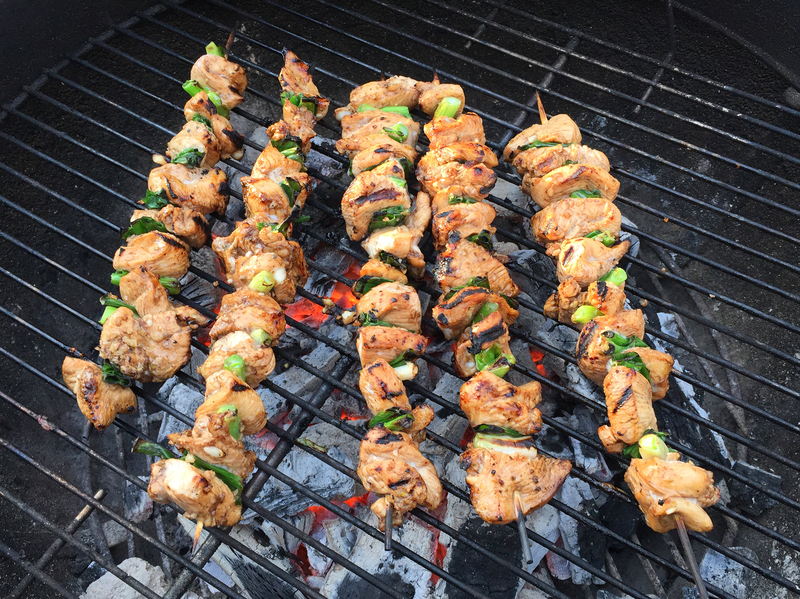 Place the wood grilling skewers in water and soak for at least 1 hour so they don’t burn when placed on the grill. 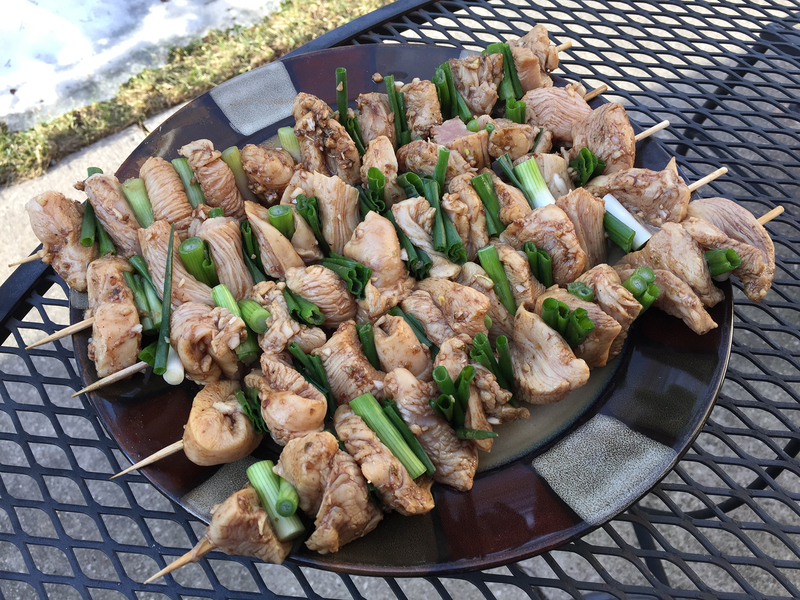 Thread the chicken onto the skewers and alternate with the scallion pieces. Ensure the chicken is secure so it doesn’t fall off the skewers. Set aside on a plate to warm up to room temperature before grilling. Discard the marinade. When ready to grill, prepare enough charcoal for a medium-hot fire. When the coal turns white-hot, level them and brush the grilling grate with peanut oil so the chicken doesn’t stick. 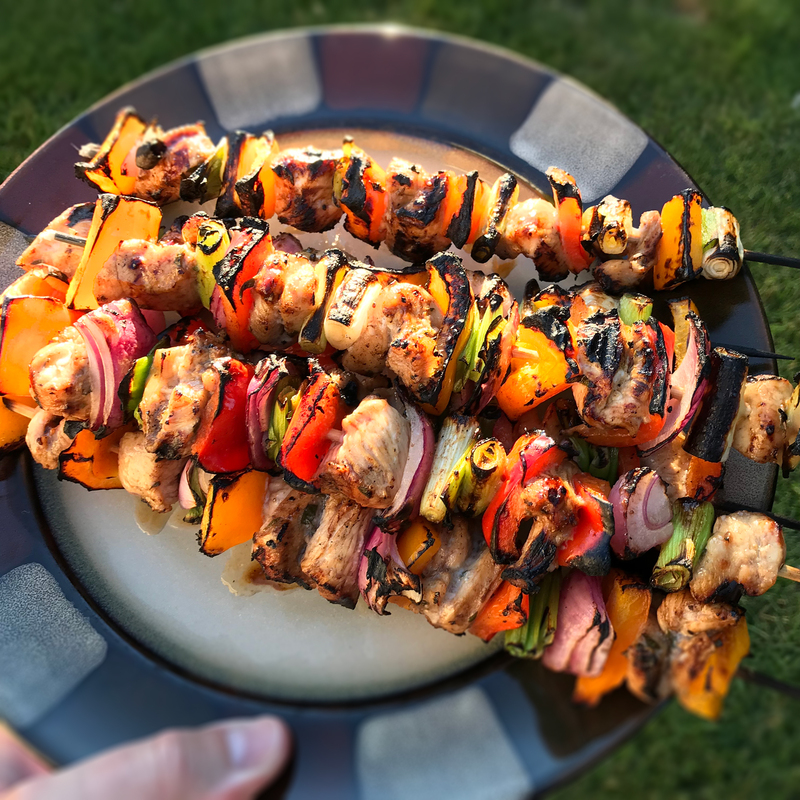 Place the skewers on the grilling grate and grill for 2-3 minutes per side until the chicken’s juices run clear and there is a nice, even char. DO NOT OVERCOOK! Remove immediately from the skewers and serve inside lightly-toasted pita bread brushed with olive oil, the tomato, red onion, Feta cheese, Kalamata olives and Tzatziki sauce. A well-seasoned cast-iron pan is a must for cornbread. Let the pan heat in the oven before adding the batter so a nice crust will form on the bottom. This loaf was baked in a 5-quart cast-iron Lodge Dutch oven with parchment paper on the bottom to prevent sticking. The refinished Martin skillet put to good use for a loaf of handcrafted artisan bread. The same Wagner #8 chicken fryer, painstakingly restored. Look at that slick black finish! I’m using it here, on the grill, to fire habanero peppers for my home-made hot sauce. Achieving a proper char after brushed with the glaze. When Thai bird’s eye peppers are dried they will darken to a beautiful earthy chocolate brown color. Store in an airtight spice jar away from direct sunlight, or place in your freezer. The smoked salsa ingredients after hour one. Blackening cherry tomatoes in a cast-iron skillet, using a propane torch. Fresh-picked garden tomatoes, Hungarian wax peppers and jalapenos.